Japanese 20th century wooden mold for rice cakes. 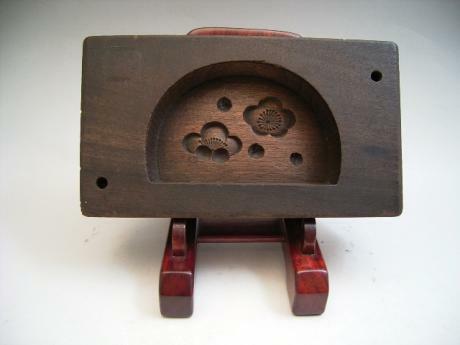 This mold is in the shape of "three friends" pine, bamboo and plum blossom. The mold's case measures 8 3/4" wide by 4" tall by 1 1/2" deep. Japanese 20th century wooden mold for rice cakes. This mold is in the shape of plum blossoms against tree branch. The mold's case measures 8" wide by 4" tall by 1 3/8" deep. Japanese 20th century wooden mold for rice cakes. 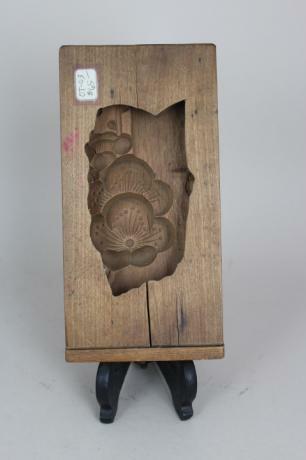 This mold is in a fan shape with plum blossoms and buds. The mold's case measures 6 1/2" wide by 3 3/4" tall by 1 1/2" deep. The mold itself measures 4" wide, 2 5/8" tall and 5/8" deep. Japanese 20th century art glass vase by master glass artist, HISATOSHI IWATA. 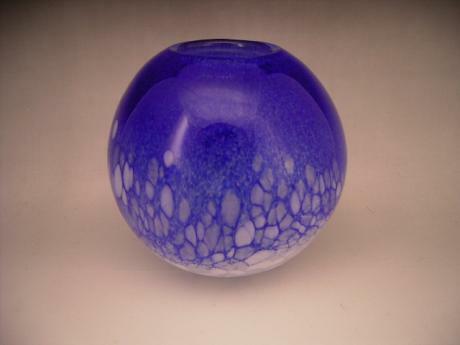 The beautiful handblown vase is done in a round shape in blue, white and clear glass. It is entitled SUIREN, or "Water Lily". Hisatoshi Iwata was born in Tokyo in 1925 and he died in 1994. 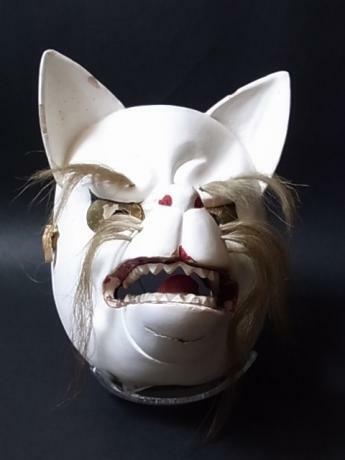 He graduated from the prestigi..
Japanese 20th century wooden mold in the shape of a TSURU, Japanese crane, for Japanese OSHIMONO, glutinous rice-flour cakes. The crane's shape is taken from above. 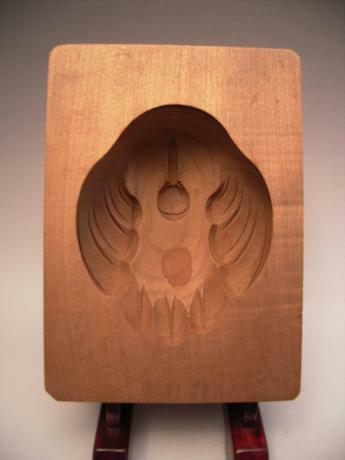 The mold's case measures 6 3/8" long, 4 1/2" wide and 2" tall. The cake part measures about 4 1/4" long by 3 1/2" wide by 1 5/8" ..
Japanese SUISEKI viewing stone on custom wooden stand. 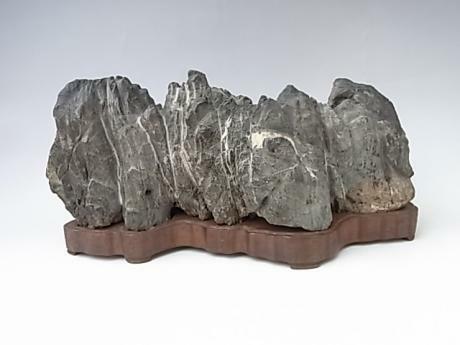 The natural stone has a form that resembles a rocky island formation. The stone is natural and the stand was custom made for the stone sometime in the early to mid 20th century. 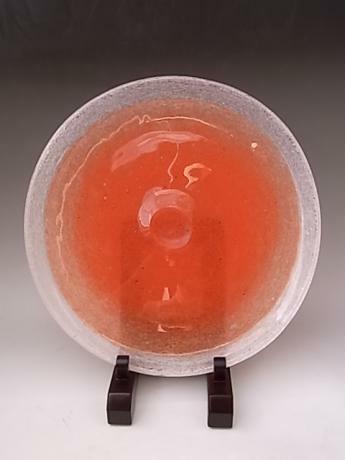 The stone and stand measure 5 3/8" tall, 11" wide and 4 1/4" deep..
Japanese mid 20th century (Showa 29 or 1954) hand blown plate by glass master IWATA TOSHICHI(1893 - 1980). A pioneer of Japanese art glass. He studied and graduated from Tokyo Geidai University, the prestigious art school. He was also an early teacher of fellow glass master, Fujita Kyohei. 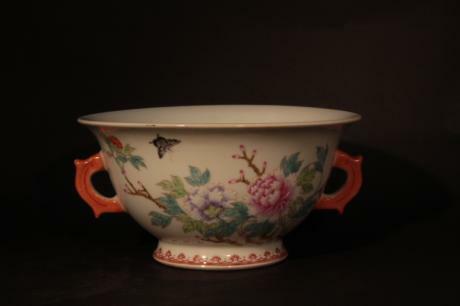 The pl..
Chinese 20th century porcelain bowl with floral and insect design. Fret key and bat motif on inside and peach and leaf on base. The bowl measures 8" wide, 7 1/2" in diameter and 4" tall. 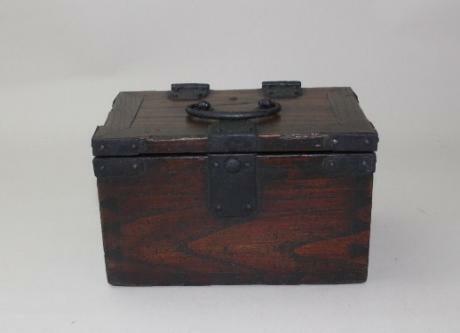 Japanese early 20th century wooden box made for storage of chops, or IN BAKO. The box measures 7" wide, 4 1/2" deep and 4 1/4" tall.